Many will be hard pushed to find too many positives from the management of Stan’s predecessor Chris Waddle. He got many things wrong but when things were just as bleak as they could be he did make the most inspired of decisions. I arrived home from work on Friday 9th January 1998 to the news that Waddle had decided to dispense with the services of striker Paul Barnes and replace him with Huddersfield Town’s Andy Payton in a straight swap. Andy Payton was a striker I had heard of, in fact more than heard of. He was a local lad who had been close to joining the Clarets straight from school. And only a couple of weeks earlier I had sat next to him in the barber’s shop waiting to have a haircut. From memory I had seen him play just twice, both times for Barnsley and both times against Burnley and both times he scored in Barnsley wins. The first of those was on the Turf and if you needed any reminding who he supported it was more than evident that night. He scored the only goal of the game but refused to celebrate with his team mates. He had done what was required of him but had scored against the one club he never wanted to score against. But back to 1998 and Waddle couldn’t quite get it right. Bottom of the league and facing a game against leaders Watford the deal didn’t go through in time. So no Payton and neither did we have Barnes who was not in the right frame of mind to play. Incredibly we beat Watford 2-0 with lone striker Andy Cooke scoring both goals. 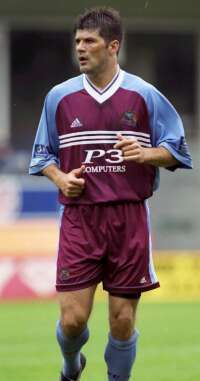 By the time the next game came along Payts was a Claret and made his debut in a 1-0 defeat at Bristol Rovers. The team he lined up in was: Marlon Beresford, Chris Brass, Mark Winstanley, Gerry Harrison, Neil Moore, Glen Little (Jamie Hoyland), Chris Waddle, Mark Ford, Andy Payton, Paul Smith, Damian Matthew (Mark Robertson). A week later he scored the only goal of the game in his home debut against Southend and the Natural Born Claret was well and truly home. 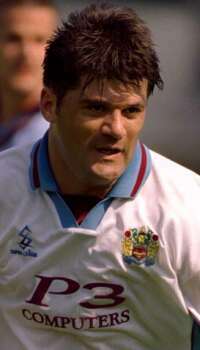 As the Clarets battled against relegation Payton scored 9 goals in 19 appearances and all but two of the goals won points. He scored one of them in a defeat and another in a 7-2 win. One other earned a point in a 1-1 draw but the other six all came in one goal wins and five of those were the winning goals. We played better as the season ended but quite simply without Payton’s goals we would have been relegated and playing 3rd Division football. There were changes at Turf Moor. Waddle left to be replaced by Bury manager and former Claret Stan Ternent. But nothing changed, we continued to struggle and Payts continued to score goals. In Ternent’s first match in charge Payton scored both goals in a 2-1 win against Bristol Rovers, the first being the first goal scored anywhere in the Football League on the opening day of the season. He was at the centre of attention when we hit new depths, going out of the FA Cup against Darlington. Two up, yes he had scored both, he was wrongly sent off and we went to pieces. Things picked up eventually and we avoided relegation and Payton had hit 20 league goals from just 40 appearances. One thing did change the following season, we were no longer 2nd Division strugglers but promotion chasers. One thing didn’t change, Payton continued to score goals. He got his first Burnley hat-trick against Colchester early in the season and continued to do what he does best and that’s scoring important goals. He also had a sense of occasion. At the very last of the Millennium we officially renamed the Jimmy McIlroy Stand. It was a fantastic day for Burnley Football Club. Andy, the only fan in the dressing room, just had to take centre stage. He ended the Millennium with another hat-trick that saw us beat Oxford 3-2 having been twice behind. After scoring twice at Stoke to earn a draw (one a penalty and one a stunner) he then brought about arguably the club’s biggest ever signing. Would we really have ever signed Ian Wright had Payts not been sent off against Bristol Rovers and received a three match ban? He signed off before the ban with the winner at Colchester and after a sticky spell with two home defeats he returned to the starting line up to score the winner at Wrexham. This one was his 200th career goal and was the day the shirt came off to display the ‘Natural Born Claret’ t-shirt. There was a stunning goal in the last home game of that season against Cambridge but the week after when promotion was clinched he didn’t score. That must have been one special moment, to support a promotion team is special but to play for the team you support when they win promotion must be something else. But 27 league goals ensured he won most of the end of season awards. Nobody could have been prouder. There had been worries that he could leave in the summer but a few weeks before the end of that fantastic promotion season he signed a new three-year deal to keep him at the Turf. He missed the return to Division One football with a broken toe but came on as a half time substitute against Hartlepool in the League Cup with us losing 1-0. He got a hat-trick and we won 4-1. Once he got back into the league team he continued to score goals and in fact ended the season as leading scorer despite only starting 18 games. Only just into his contract Payton’s time was running out. In December we resumed hostilities with our neighbours from just down the M65. Nobody on the pitch felt the defeat more but the game played in December 2000 proved to be the last full 90 minutes Andy ever played for the club. 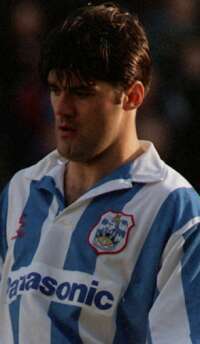 In the next couple of months he started another three games, but was substituted in all of them, replaced by Brad Maylett and John Mullin (twice). On 10th February the road outside Turf Moor was renamed Harry Potts Way. Later that afternoon Andy Payton started a Burnley game for the very last time in a 2-1 home defeat against Crystal Palace. Palace scored their late winner after he had left the field. Since then there have been a number of substitute appearances but ever diminishing substitute appearances. This season he has come on just twice, against Sheffield United and the cup replay against Grimsby. He has hardly played in the reserves either. Last season there was the brief loan spell at Blackpool during which he scored his last ever league goal against Bury. Asked by Radio Lancashire’s Ian Chisnall if this was the first of many for the Tangerines he said not because he was Claret & Blue. His last goal shouldn’t have been in a tangerine shirt, it really should have been in the Claret & Blue of his beloved Burnley. The last Burnley goal came in a 3-3 draw against Barnsley earlier last season, a late penalty. When looking back at Andy’s time at the Turf the last two years or so can really be ignored. What matters is what he did in his first three years at the club and with no disrespect to any other player it is quite simple. His goals kept us up for two years and got us up the next season. He is without doubt the best goal scorer many Burnley fans have ever seen. That has to be the case, he is the best since Willie Irvine was scoring at an incredible rate in the First Division in the 1960s. This Natural Born Claret got the chance to do what we would all have loved to do – he played for Burnley. And he did it with great success and never let down those of us who never got that chance. 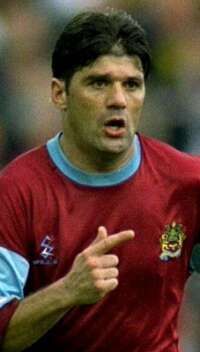 Whatever the reasons for the last two years is irrelevant, if it is anything to do with off field activities as has been suggested then so be it but we here are interested in Andy Payton the footballer, Andy Payton the Burnley goal scorer. Burnley are a better club for having had Andy Payton play for them – best wishes Andy in whatever you do and thanks for every goal and everything you have done for our club. I do have a feeling that he might well be seen around Turf Moor in the future.